Nitric oxide (NO) partakes in a wide array of physiological processes that include vasodilation, smooth muscle relaxation, neurotransmission, and the immune response. In mammals NO is mainly synthesized from L-arginine (Arg) by nitric-oxide synthase (NOS, see schematic structure on the left), which catalyzes the conversion of L-arginine into L-citrulline and NO in two steps with N-hydroxy-L-arginine as an intermediate. Both steps require O2 and NADPH-derived electrons. 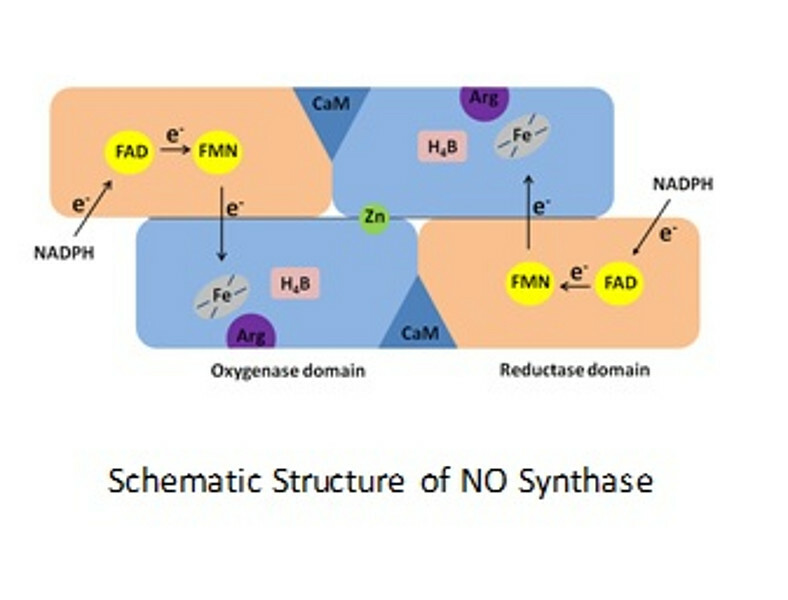 In many respects NOS resembles cytochrome P450: both enzymes catalyze mono-oxygenations at a Cys-ligated heme and in both cases the required electrons are shuttled from NADPH to the heme via two flavins (one FAD and one FMN moiety). However, among cytochrome P450-type enzymes, NOS is unique in utilizing tetrahydrobiopterin (BH4, see structure on the right) as an additional cofactor. We have been interested in elucidating the role of BH4 in NO synthesis. Early on it was shown that, when BH4 is absent, NOS still oxidizes NADPH and reduces O2, but it cannot oxidize Arg. Under these conditions NOS produces O2- instead of NO and citrulline. This reaction, which NOS shares with CytP450 (see reaction cycle on the left), is called uncoupling. It can be particularly damaging in the case of NOS catalysis, since O2- and NO react avidly to produce peroxynitrite (ONOO-), which is powerful oxidant. 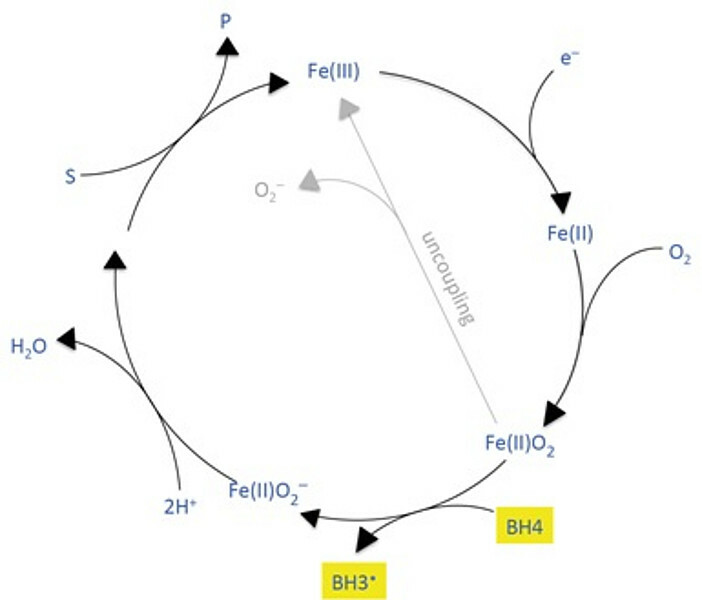 From studies in our and other laboratories, it is now clear that BH4 prevents uncoupling by serving as an electron donor to the Fe(II)O2-complex that is formed after reduction of the heme (by NADPH-derived electron via the flavins) and O2 binding. This complex is unstable and electron transfer via the flavins is too slow to prevent its decomposition to Fe(III) and O2-. 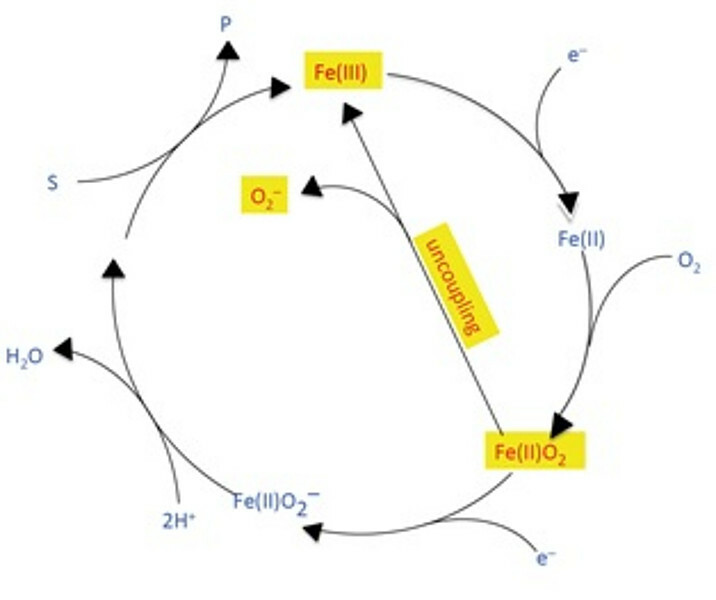 Although BH4 is a poor 1-electron donor (it will not reduce the ferric (Fe(III)) heme, it is situated close to the heme, and will reduce the oxyferrous complex rapidly (see reaction cycle on the right. Why does BH4 reduce the oxyferrous Fe(II)O2 complex but not the ferric Fe(III) heme? What is the pathway(s) of interdomain electron transfer? Is the FMN semiquinone (FMNH•), which is unable to reduce the oxyferrous complex, a viable electron donor for the BH3• radical? Which reaction steps govern the decrease of NOS activity at low (< 7.0) and high (> 8.0) pH? The NOS dimer has been shown to bind one equiv. of BH4 with high affinity (Kd ≤ 1 nM) and one equiv. with lower affinity (Kd ~ 0.1-1.0 µM): What are the nature, the mechanism, and the functional implications of heterogeneous BH4 binding?